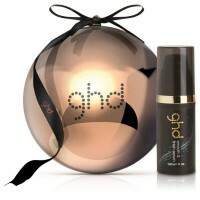 Luxurious yet fun, the ghd Sooth and Finish Serum Limited Edition Bauble (30ml) is the perfect pampering stocking filler. The Smooth and Finish Serum is a luxurious finishing serum that adds instant shine and lustre to hair with each application. Ideal for adding shine and smoothness to straight styles, this serum can also be used to tame and define curls and waves, control flyaway hair caused by static and disguise the appearance of split and dry ends. For best results, dispense one pump for fine to normal hair, or a pump and a half for thick or coarse hair and massage between your palms and fingers until they`re evenly covered, then work through mid-lengths and ends of your finished style, avoiding the root area. •ghd Luxurious yet fun, the ghd Sooth and Finish Serum Limited Edition Bauble (30ml) the perfect pampering stocking filler.